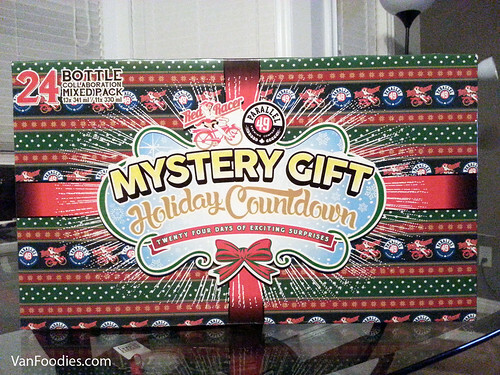 As you know, I’m drinking a beer every day from the Central City/Parallel 49 Mystery Gift Holiday Countdown. If you missed the first half, you can check it out here. And don’t miss my halfway update — which includes my admission to having made a mistake. Now, on to the second half. 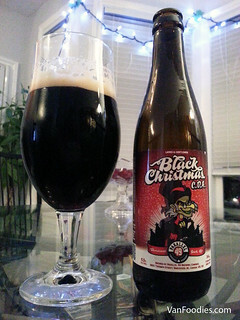 Today my mystery box gifted me a bottle of Black Christmas CDA (Christmas Dark Ale in this case). This take eschews the normally liberal dose of vanilla found in winter seasonals, and comes out more like a normal CDA (Cascadian Dark Ale), in my opinion. Though it is more caramel and cocoa in smell and taste. An enjoyable beer and nice change from some of the more plain styles we’ve seen recently. Tomorrow I’m going to guess Red Racer ISA! Right again!! What’s that, 2 out of…well let’s just not calculate my success rate right now. 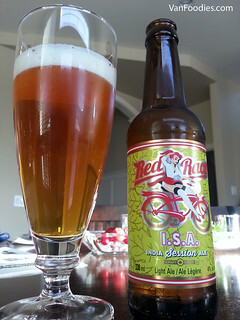 So I haven’t had the opportunity to try the Red Racer ISA yet, though I admit I was never particularly excited about it. It sounded a lot like a nerfed IPA to me. So now that I’ve tasted it, has my opinion changed? Nope. I think I could get behind this if it more resembled their IPA at a very sessionable 4% ABU, but unfortunately it doesn’t. In fact, it simply retains the bitterness without bringing along all those great citrus flavours found in big brother IPA. If it comes down to a case of being able to drink more because of it having less alcohol content, I’d very much rather drink one RR IPA than two of these. Tomorrow I’m going to guess Salty Scot yet again, I’m still holding to the believe it’ll turn up eventually. [Christmas on VanFoodies] Halfway Through #MysteryGift – What Was I Thinking? From Parallel 49 – Schwarzwald Chocolate Cherry Porter, Filthy Dirty IPA, Old Boy, Toques of Hazzard, Hoparazzi, Craft Lager, and Black Christmas CDA (That one is Day 13). From Central City – Pilsner, Wheat Ale, Oatmeal Stout, Pale Ale, ESB/Red Ale, and Copper Ale. Some pretty solid beers so far, though I’d certainly give P49 the nod for having more interesting brews (and names!). Overall the best beers have been the Schwarzwald and Toques, hands down. Schwarzwald was a great start to the calendar and Toques is just plain awesome and a very welcomed surprise early on. Overall, it’s not a bad list. There isn’t a lot to inspire so far but we’re only halfway. I’m fully expecting some pretty awesome stuff to come out near the end. That said, there were a few days where I (among others) were getting a bit bored, especially when the bottle of Craft Lager made its appearance. On Twitter, there were tweets ranging from “Actually angry now” (Mine. I was tired, grumpy, and feeling particularly aggrieved), “Bottled Disappointment” (regarding the craft lager), to even one that tagged both breweries asking when the boring beers were going to end. That last one has since been deleted. 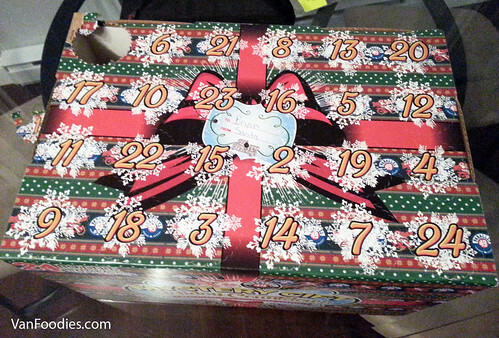 [Christmas on VanFoodies] Counting Down with a Beer Advent Calendar! Hi, everyone! I’ve returned from my long absence from beer blogging. What was I doing, you ask? Well, I was working, playing with my cat, and gaming. Oh, and I published a novel! You should totally check it out here. Now, on to the beer. 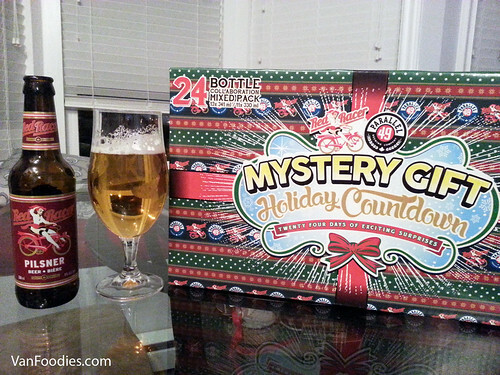 For the month of December I’m going to be drinking a beer every day from the Central City/Parallel 49 advent calendar (they call it a Mystery Gift Holiday Countdown…but let’s call it what it is), then I will be updating this space with my impressions. So be sure to check back daily! I was hoping CC/P49 would kick the calendar off with something cool, and they didn’t disappoint. 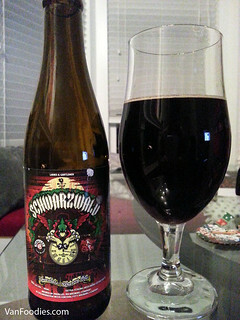 I happily pulled out a bottle of the black forest cake-inspired Schwarzwald Chocolate Cherry Porter. The pour is black, with a head that disappears almost immediately. The aroma is all chocolate goodness and so is the flavour, along with a healthy dose of cherry that comes in just after the chocolate mellows. It is sweet but not too sweet. That said, I’m happy the bottles are only 341ml, as I think a bomber might just be a bit too much to drink at once. With the memory of that excellent porter from Day 1 still fresh in my mind, I punched in the hole for Day 2 and pulled out a…(drum roll) Red Racer Pilsner. The former Saskatchewan resident in me cheered gleefully when I pulled out that bottle. To a Saskatchewanian, true bliss is coming in from a snowmobile ride, popping a glass of Pil, and sitting down to watch replays of famous Rider victories, like the 52-0 smashing of the Bombers in 2012 (Rider Pride!). In fact, I’m pretty sure the perfect Saskatchewan Advent Calendar would be 24 days of Pilsner. The Red Racer Pilsner isn’t like the Old Style Pilsner Saskatchewanians are used to, however. Instead of tasting, well, bad, this Pil has real flavour. A bit of spice, real light hop bitterness, maybe even a bit of bread. In fact, I find it downright drinkable, and I’m not a pilsner guy. For what many will view as a filler, I find it surprisingly decent. I was sad when Parallel 49’s Lord of the Hops finished its glorious run. What a great IPA it was, and shame on the Tolkien estate for litigating it. 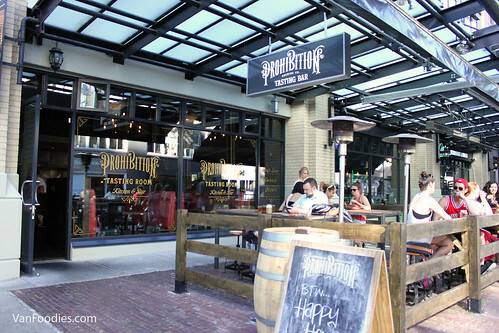 Prohibition Brewing & Tasting Room – Beer & Wings…of Duck?! Bryan and I were invited to check out the new Prohibition Tasting Room, in the location of where Cache Bistro used to be in Yaletown. 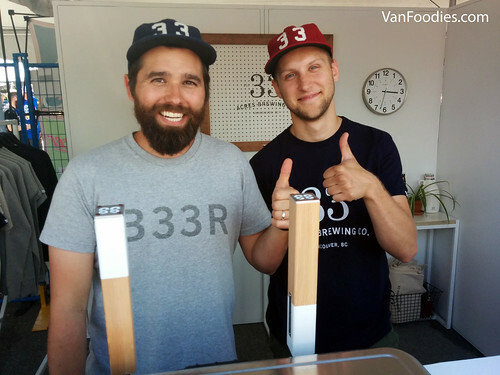 We had the opportunity to sample its beers and a number of dishes on the menu. 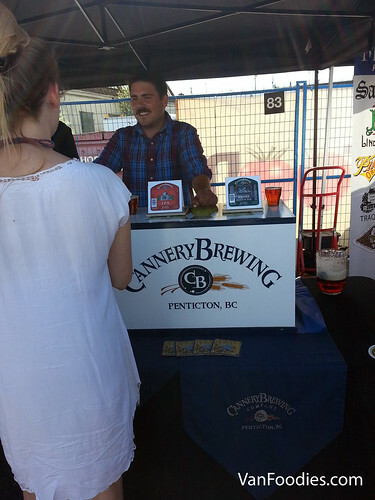 The beers are not brewed on location; they are being brewed in Kelowna then shipped to here. Food is prepared on location, with a lot of items made in-house or sourced locally. In this post, I will focus on the food, and Bryan will share his thoughts on the beer and drinks. To be honest I’m not a pretzel fan, mostly because I don’t like the amount of salt that they usually use and sometimes it’s too dense that my jaw gets tired from chewing it. Not these ones. 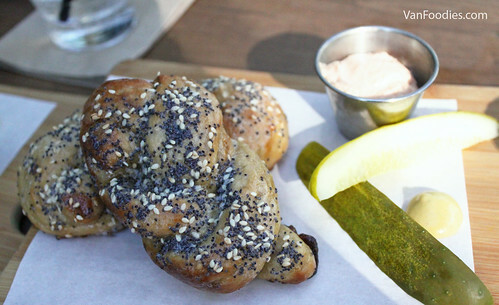 I would eat these Pretzel Knots again and again. They were made in-house and the cooks intentionally added a hint of sweetness to the dough so it’s not loaded with sodium. And the pretzels were not too dense, just enough that they were still pillowy. They were more like bread and I liked it. The poppy seeds and sesame seeds added some crunch to the pretzel. The beer cheese was provided as a spread but I think it tasted quite good on its own. 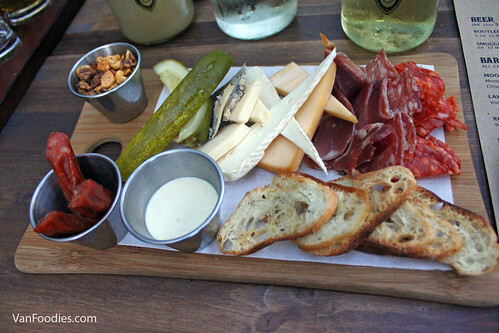 The Charcuterie Board had a good selection of cheeses, soft and hard, creamy and nutty aged cheese, even a pungent one. The meat was leaning towards the spicy side for me but it helped whet my appetite. There’s a serving of Beer Nuts on the side here; the spice mix worked really with the nuts and they were great to be snacking on, while paired with beer. In 1862, New Westminster was granted the third brewery license in BC, and from then on, the city has had a proud tradition of brewing. New West even had what I would call a “Beer Baron”, in Nels Nelson. Nelson consolidated the brewing in New West and was even granted a special exemption during prohibition to brew beer for export (much of which was illegally sold in New West anyway). That, along with a special brewing license granted after prohibition was lifted, helped Nelson become one of the richest and most influential figures in the city. You can still see the mansion he built in 1913 at 127 Queens Ave. Eventually, Nelson sold his business and over time it transformed until we ended up with a Labatt brewery at the corner of Columbia and Brunette. And that didn’t last forever, either, as it closed in 2005, bringing to a close the brewing tradition of New Westminster. 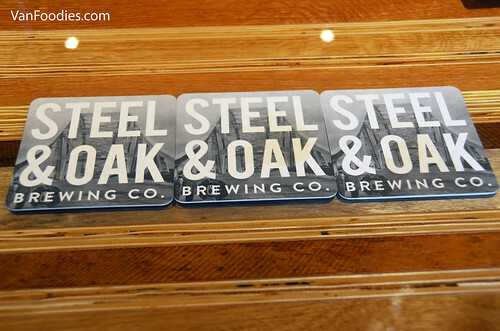 Enter: Steel & Oak Brewing Co. I first heard about Steel & Oak on October 1, 2013, when they tweeted “#CraftBeer is coming to #NewWest!”. I was, shall we say, excited. And that was even before I found out they’re a mere 5 minute walk from my place. Fast forward 8 ½ months and countless brewery building pictures on Instagram, and S&O is getting ready to open their doors. 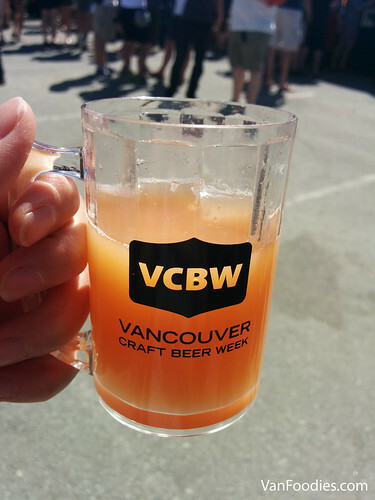 Most Refreshing Beer on a Hot Day – This one ends in a three-way tie between the Mission Springs Lemon Ginger Radler, Parallel 49 Tricycle, and Storm Orange Creamsicle. 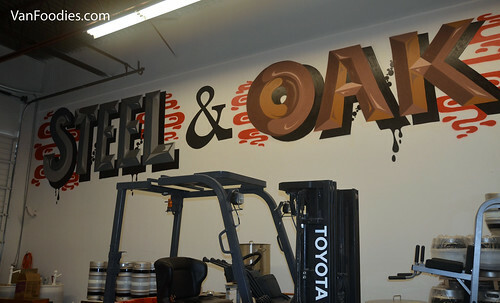 Brewery I’m most excited about opening – Steel & Oak. The hefe didn’t disappoint. Now I’m even more interested, if that was even possible, in what these guys will have available when they open. Best Cider – It was a pretty tight field, but I’m going to have to give this one to the Cyser by (Surprise!) Merridale Cider. Biggest Surprise – The booth with Dieu Du Ciel samples totally blew me away. Though, it makes sense because their stuff has recently started showing up in liquor stores in the area. The distributor must be trying to promote them to the locals. Best Potential Tie-in – Dead Frog Rocket Man ESB. Call me crazy, but I really want to sit back on my patio with a bottle of this while Rocket Man plays on the stereo. Best Name – Berried Alive. Best T-Shirt – B33R, at 33 Acres. 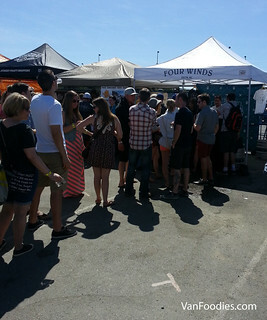 So far, I haven’t had a Four Winds beer that I didn’t like, and I’m happy to see that tradition continue. This Rye Wheat IPA didn’t blow my mind like the Juxtapose Brett IPA did, but it certainly didn’t disappoint either. Definitely worth drinking. Last time I was in Kitchener, I had a flight of Mill Street beers. I didn’t like a single one. I couldn’t even finish the paddle. So I approached this booth with a bit of trepidation. Fortunately it was totally unfounded because their Vanilla Porter is actually really good! Absolutely worth a try. This is the kind of beer that really benefits from a hot, cloudless day. Here I was, sweating away, skin doing its best “cooked lobster” impression, when bam – a fist called refreshing hit me in the face. It’s hard to say how much, if at all, I would like this on a cool, winter night, but when I drank this with the sun beating down on me, it tasted great. Compared to the other tasty fruit beers available, this one was decidedly lacking. One of Cannery’s year round releases, the Squire Scotch Ale is one of the better scotch ales I’ve had recently.